Being successful and even famous is the dream of many artists. But, only a few, no matter how hard they work, will meet fame and fortune. Among those few is Damien Hirst, whose 13-foot tiger shark floating in a formaldehyde-filled tank became a sensation in 1991. 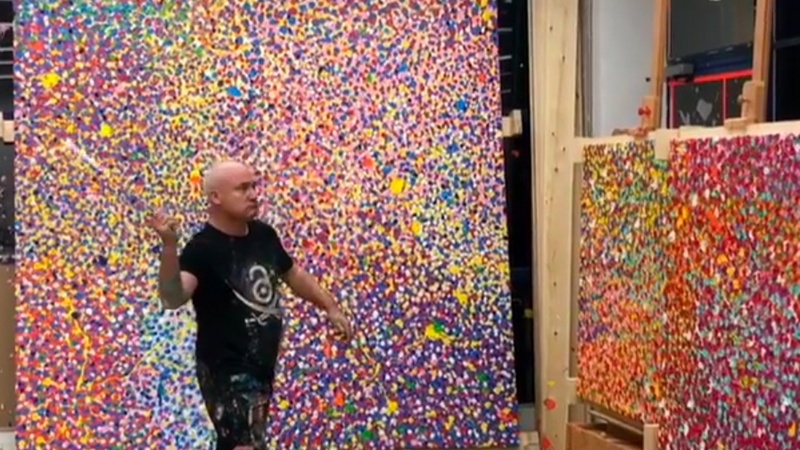 Ever since, Hirst, with the help of an army of assistants, produced hundreds, if not thousands, of newsworthy, attention-grabbing artworks. Medicine Cabinets, filled with real medicine containers. Paintings made with thousands of real butterfly wings. A platinum cast of a human skull, covered in thousands of diamonds. In 2012, at his last exhibition at Gagosian gallery in Beverly Hills, Hirst showed his Spot paintings, produced by assistants with his meticulous instructions. With all the above in mind, I went to see his current exhibition of his new Veil Paintings at Gagosian Beverly Hills with a dose of skepticism. 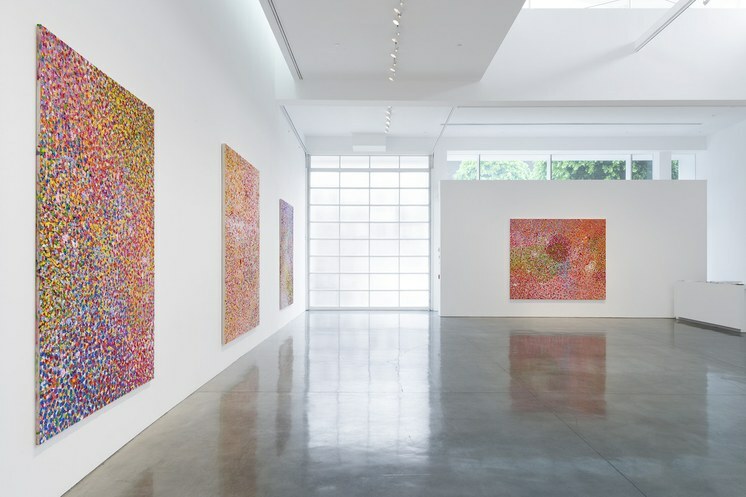 Installation shot, The Veil Paintings, Damien Hirst. 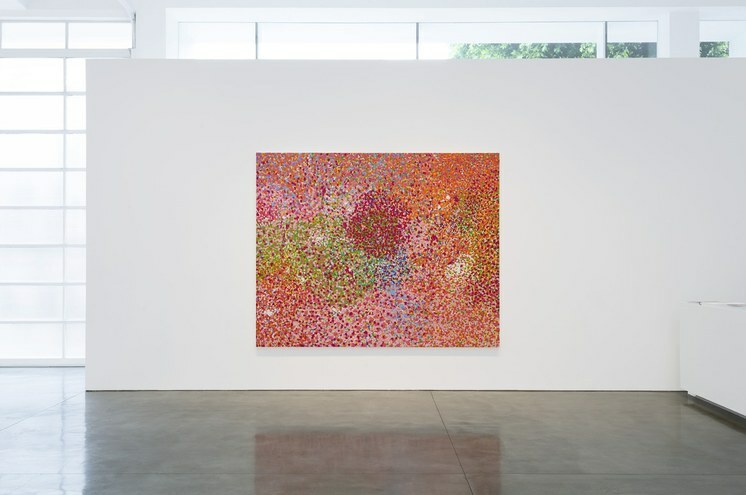 Gagosian, Beverly Hills. Photo courtesy of Gagosian. What I saw and experienced there surprised and challenged me. The 24, mostly large, abstract oil paintings have amazingly rich texture; each brushstroke becomes a tiny sculpture. 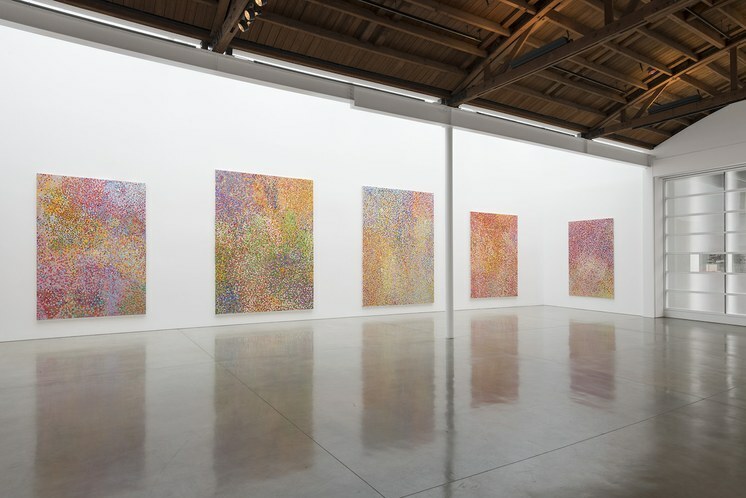 Installation shot, The Veil Paintings, Damien Hirst. Gagosian, Beverly Hills. Photo courtesy Gagosian. And, all of these paintings, I was told, are made by the artist himself – no assistants involved. I didn’t intend to spend more than 10-15 minutes in the gallery, but ended up exploring these paintings for almost an hour. Looking at his canvases from a distance, you may find yourself “hearing,” so to speak, the echoes of Water Lilies paintings by Claude Monet. But, if you come close, with your nose almost touching the canvas, you might discover a rolling, lush landscape of hills and forests. And, be sure that you see the paintings not only head-on, but also from the left and the right. They are like a human face that intrigues you and looks different from every angle. 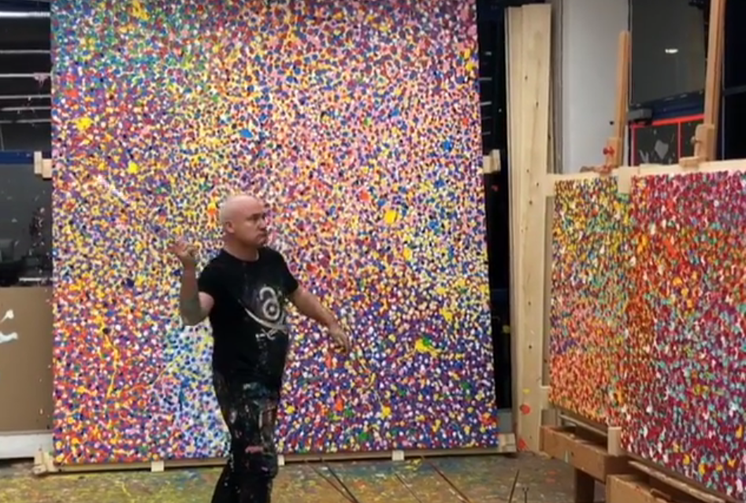 Definitely check out Hirst’s video on his Instagram page, to watch the artist using his paintbrush like a sword to attack the canvas. By the way, I don’t want to disappoint you, but all the paintings – most of them $1m plus – are already sold. Still from the trailer for Final Portrait. But, here is a pleasure that you can afford and is still available: a new movie, Final Portrait, about Alberto Giacometti, working, sweating, swearing, while making a portrait of his friend, American critic James Lord. Usually, when I see movies about great artists, it’s rather embarrassing to see wonderful actors trying and pretending to create a masterpiece. But, here, in this movie directed by Stanley Tucci, we see Oscar-winning actor Geoffrey Rush miraculously becoming Giacometti in a movie set that meticulously recreated the artist’s studio. Several times I caught myself, thinking that I was watching a documentary, not a scripted film. 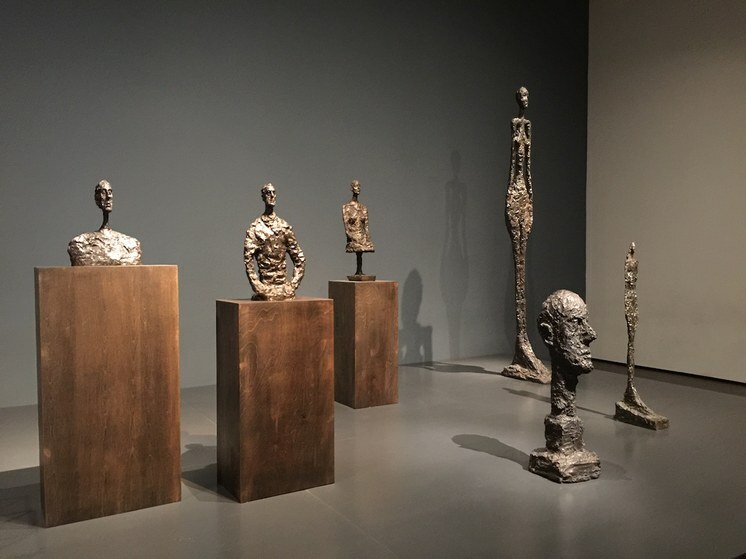 Installation shot of LACMA’s permanent collection, featuring works by Giacometti. Los Angeles. Photo by Edward Goldman. After seeing the movie, I went to LACMA to visit its elegantly installed collection of Giacometti bronze sculptures. His mysterious, elongated, slightly tortured bronze figures bear marks, as if his fingers are still molding and shaping the texture of the surface.